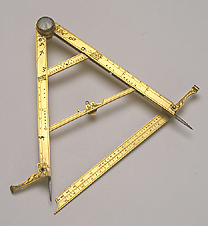 Folding brass rule with scale of 12 inches carried across both legs, numbered by 1, each inch being subdivided into the appropriate number of parts from 1 to 12. The other face has, on either leg, 3-inch scales of 'PES ROMANI' and 'PES WEINA', with each inches subdivided correspondingly to 1, 2 or 3 parts. The outer rim has the signature: 'CHRISTOPHORVS SCHISSLER FATIEBAT PRAG? BOHEMI? ANNO 1595'. The 3-leaf hinge incorporates a glazed magnetic compass. Each leg terminates with a steel point, and at each end is a pivoted extension ending in a ring (one is broken) that allows the instrument to be suspended. The legs also accommodate two pivoted struts, one stowed on each side, and these can be extended to catches in the other side when the instrument is to be used as a level. When the instrument functions as a level, it can be used either standing on hanging, as the lower strut and the hinge are marked 'LINEATI PERPEN' and 'LINIA PERPENTICV' respectively. The upper strut in marked 'SCALA HOROLOGIA SOLIS' and probably accommodated the gnomon (missing) for a horizontal sundial, whose hour lines 3 to 7 and 5 to 9 and marked on the two legs. When the rule is open, a flat rule pivoted at the end of one leg (the securing screw is missing) can be accommodated by a pivoted sleeve on the other, and has three scales for shot: 'GLOBI FERREI' (1 to 40), 'GLOBI PLVMEI' (1 to 30) and 'GLOBI LAPIDI' (1 to 10), and one linear scale 1 to 12, divided to 1, subdivided to 1/2 and to 1/4, numbered by 1. When the instrument is folded, the end of this rule is accommodated by the curve of the compass casing. Foliate decoration has been engraved on various spaces not used for scales.